Canada’s Restoration Services' experienced and certified IICRC technicians perform effective mold removal & remediation; eliminating hazardous mould spores and mould growth from buildings, homes and personal possessions. Serving Cooksville -Mississauga, we often work with 3rd party experts such as hygienists and certified inspectors in order to prevent a conflict of interest. Canada’s Restoration Services objective is to ensure no presence of Mold - airborne or visible exists once we complete the project. For this process we have many different types of equipment available to us such as: media blasting, air scrubbers and negative air machines, thermal cameras and more. Mold is harmful to us and its symptoms are different from individual to individual. Mold does affect our immune system and can cause health problems, in some cases, severely threatening problems. Common symptoms consistent with mold are: allergic reactions, nausea, headaches, respiratory illness, itchiness and more. If your home or property has visible mold, give us a call today. We will schedule a Free Mold Inspection! No matter how big or how small, we can help! Air Quality Testing (also known as AQT) - What is this term? Why is it important? Canada’s Restoration Services experts understand how to make the air you breathe healthy. Indoor air quality should match the outside air quality and is measured by spore count. We have Mold Remediation experience, Mold Removal & Cleanup Services with scopes of work that are presented to the customer or written by a 3rd party all in alliance with the IICRC guidelines for Mold Removal and Mold Remediation. Canada’s Restoration Services has a preferred Six Step Process for a Successful Mold Remediation. Free Visual Inspection - to identify potential visible mold upon your request. Lab testing (3rd Party Lab) - helps us understand the Air Quality present & build the scope of services. Prepare the scope of work and present it to you. Commence the work with the Containment (The most important part to prevent cross contamination with the use of negative air scrubbers). Mold decontamination & Mold spore removal procedures using eco-friendlyproducts. Clearance by a 3rd party to verify that spores count is according to standard, and scope has been performed perfectly. Mould damage repair with our reconstruction department. 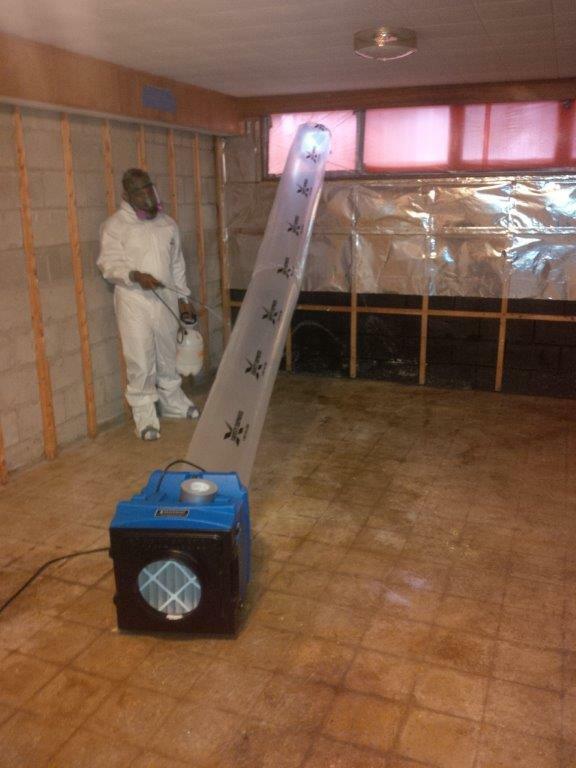 Canada's Restoration Services has experience with Small (1 foot of Mold) to Full Remediation projects such as Grow Ops in the Cooksville -Mississauga and Montreal Areas. Clearance - We suggest that 3rd party clearance be performed following the Mold Remediation process. We are sure to pass clearance as part of our Six Step Process for a Successful Mold Remediation. Eco-Friendly & Canadian - We use Canadian based products if available and green plant based eco-friendly supplies in our mold removal / remediation process. Being flexible to your needs is part of our values; we will work around your schedule. Don't wait until it's too late! Immediate action is required upon the first signs of mold infestation. Cooksville -Mississauga is a neighborhood in the city of Mississauga, Ontario, Canada. It is located at the intersection of Dundas Street and Hurontario Street. We serve the Brampton Mississauga area’s daily, we have crews that live in the area’s so we can help you and be flexible to your needs. The many roads leading to and from the area enable easy access in order to serve you and the properties. In case of an emergency flood/water damage or a mold related problem that requires Mold removal.